FOXBOROUGH, Mass. 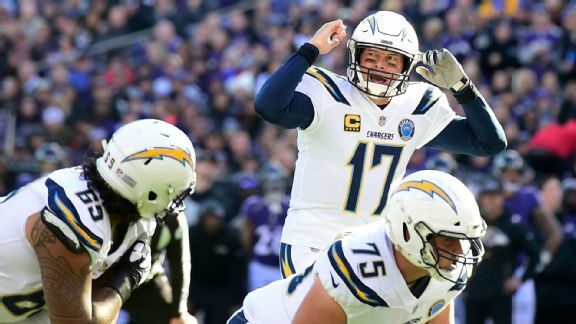 -- Nobody needs to tell Philip Rivers he has never beaten the quarterback who will be on the other side of the field Sunday in an AFC divisional-round playoff game against the New England Patriots. The Los Angeles Chargers quarterback knows full well about Tom Brady’s perfect record against him. He also knows that while Brady can pretty much block out his calendar every year for the AFC Championship Game, it’s an engagement that has eluded Rivers for more than a decade. These are not minor details that get lost on a quarterback who has been around the league for 15 years and has a photographic football memory. Rivers would have remembered beating Brady and the Patriots, especially if it were in either of their two playoff matchups early in his career when Brady threw three interceptions in each game. But those were a long time ago, and these opportunities to join Brady in the Super Bowl winners' club haven’t come around often for Rivers in recent years. Last Sunday afternoon in Baltimore was Rivers' first playoff game in five years. This Sunday against the Patriots could be a seminal moment in his career if he can outduel his more accomplished playoff counterpart for the first time. Tom Brady's postseason dominance over Philip Rivers is tied for the third best in the Super Bowl era. “Obviously, Tom's worried about our defense just like I am theirs, but it is pretty special to have an opportunity again to go against a quarterback-led team in Tom Brady,” Rivers said this week. Rivers and Brady have met seven times previously. The only victory for Rivers and the Chargers against the Patriots came when Matt Cassel was in for an injured Brady in 2008. Despite New England being a four-point favorite, many consider the Chargers to be the better all-around team or at least a very lively underdog. The contest will feature the oldest pair of starting quarterbacks in postseason history, with Brady at 41 years old and Rivers having recently turned 37. That is a combined 78 years and 198 days between the two. Brady explained that he still relishes the opportunity to play the game he loves. That is easy to say when he’s on the verge of reaching an eighth straight AFC Championship Game. This season was a revival for Rivers and the Chargers (12-4), who finished with a better record than the Patriots (11-5) for the first time since 2009. “It’s not something you think about a whole lot," Rivers said of his record against Brady. "It exists and is there, and I mean this: I don’t feel I’m playing Tom. That is because the rivalry is pretty much nonexistent. Rivers and Brady have played against each other just twice in the past seven seasons. Rivers admitted they don’t have much of a personal relationship and haven’t crossed paths often off the field over the years. That’s almost odd considering their longevity and the general quarterback fraternity that exists. But it’s reality. Brady has gone on to be a regular in title games with a handful of Super Bowls, while Rivers resides in the Dan Marino category of best quarterbacks to never win one. Tom Brady's impressive stats versus Philip Rivers aren't limited to wins and losses. There was a time when it appeared Rivers-Brady was headed in the direction of what Brady-Peyton Manning became. Eight years into Brady’s career, he had faced Manning three times in the postseason and Rivers twice. Those were in Rivers’ first two years as a starter, and he was just 26 and rapidly improving. Surely there would be more after that memorable 21-12 Patriots victory in the AFC Championship Game during the 2007 season when Rivers played with a torn knee ligament. They finally meet again with something serious at stake 11 years later. It does have something to do with it all coming back full circle for Rivers. He has a chance to exorcise his demons. He returns to Foxborough, the site of that championship game loss, and to a venue where he has never won. The obstacles extend beyond the Patriots, who were 8-0 at home in the regular season. Early forecasts call for a high of 27 degrees on Sunday. Rivers is 1-4 in his career (including playoffs) when the game-time temperature is at or below freezing. He hasn’t played in such a game since 2014. Rivers has thrown seven touchdowns and six interceptions in the five career games in freezing temperatures, an environment in which his counterpart has thrived. 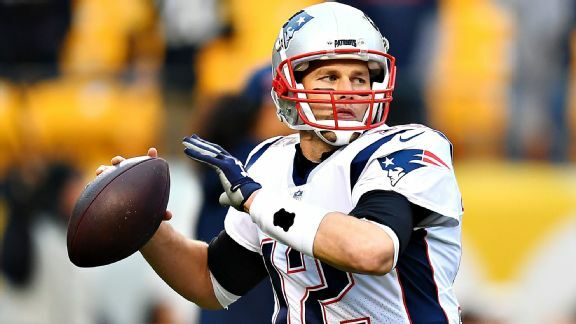 Brady is 24-7 with 63 touchdown passes and 24 interceptions in cold-temperature games; his .774 win percentage ranks right at the top of quarterbacks to start at least five such games. Rivers’ .200 win percentage ranks 31st out of 32 qualifying QBs. The odds are stacked against Rivers and the Chargers, who play on the East Coast for the second straight week. The good news: They are 8-0 in games outside of Los Angeles and bring perhaps their best team to New England since that last championship game loss. This could be Rivers’ last -- and best -- chance to get Brady, the Patriots and that ring.